Find the first future tense sentence in the first paragraph. Find the phrase that says: I didn’t know 8-year-old kids used these words. What does the word “bedeutet” mean? (Hint: I just told you what it meant!) What is the main idea of this paragraph? Rectangle Circle Various letters (of the alphabet) Keine Ahnung = No idea. Top of page 14. What do you think Autokennzeichen are? 4 Kapitel 1. Seite 14. 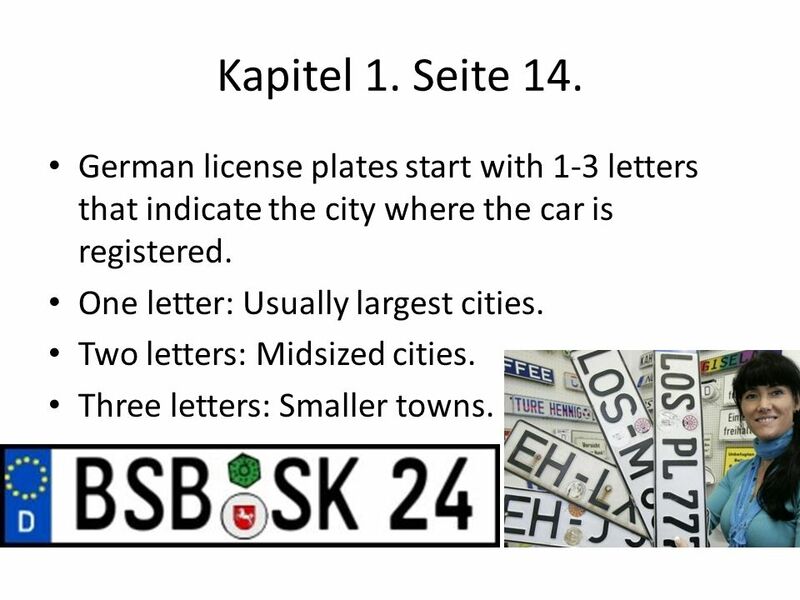 German license plates start with 1-3 letters that indicate the city where the car is registered. One letter: Usually largest cities. Two letters: Midsized cities. Three letters: Smaller towns. 5 Kapitel 1. Seite 14. 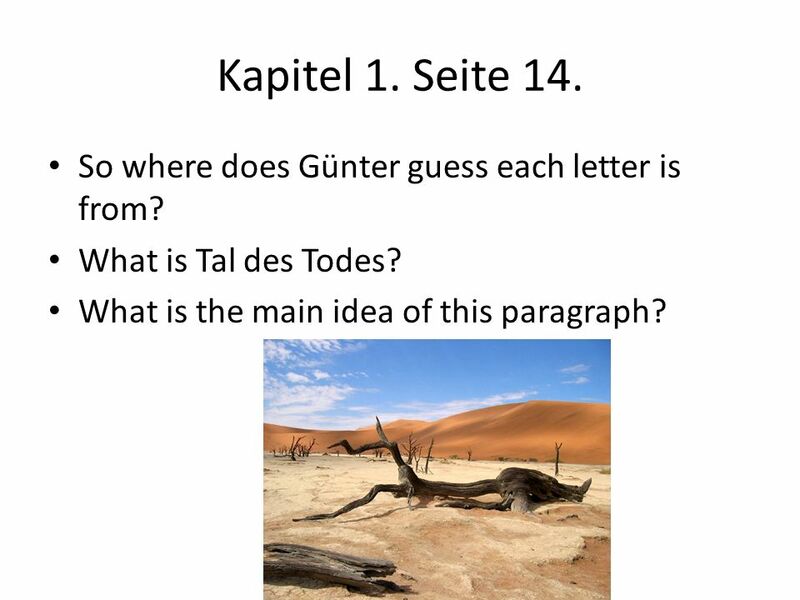 So where does Günter guess each letter is from? What is Tal des Todes? What is the main idea of this paragraph? 6 Kapitel 2. Seite 14. 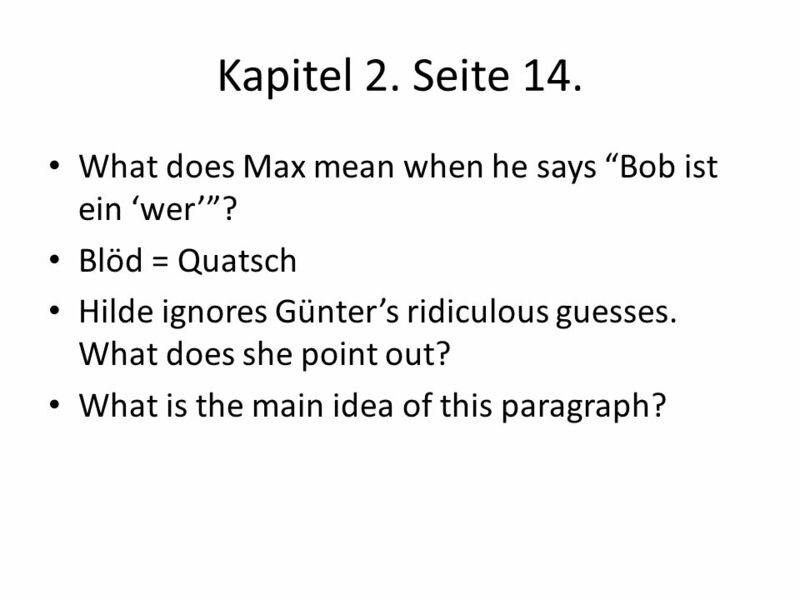 What does Max mean when he says “Bob ist ein ‘wer’”? Blöd = Quatsch Hilde ignores Günter’s ridiculous guesses. What does she point out? What is the main idea of this paragraph? 7 Kapitel 2. 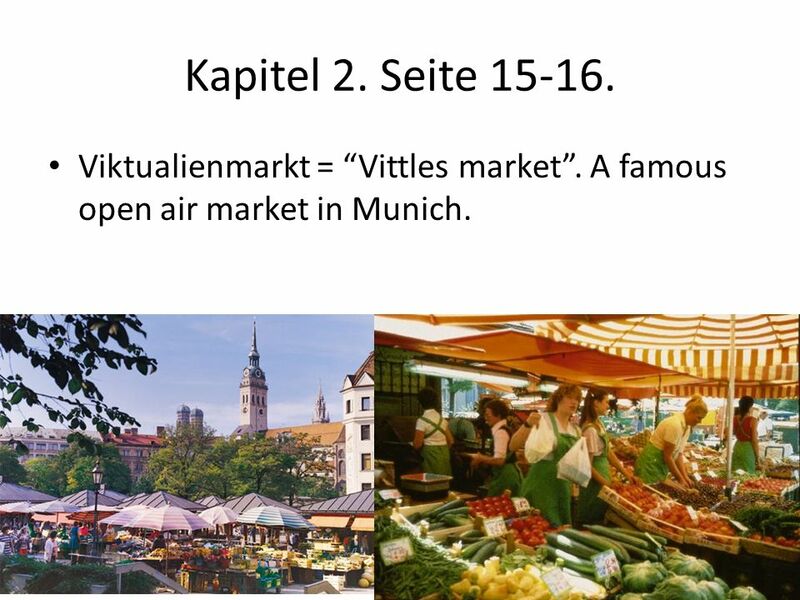 Seite Viktualienmarkt = “Vittles market”. A famous open air market in Munich. 8 Kapitel 2. Seite There is a different kind of greeting in Munich. What is is? What does it mean? What are they asking the farmer? What are the farmer’s guesses of the symbols? 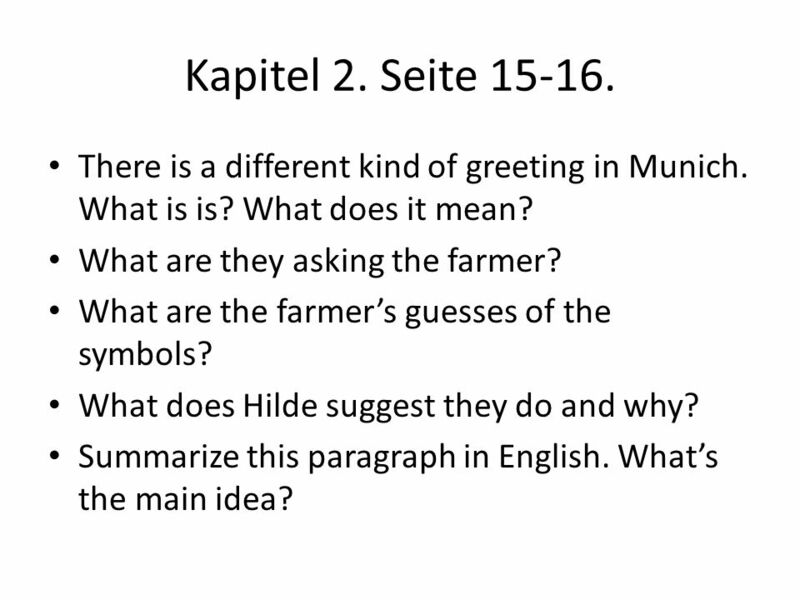 What does Hilde suggest they do and why? Summarize this paragraph in English. What’s the main idea? 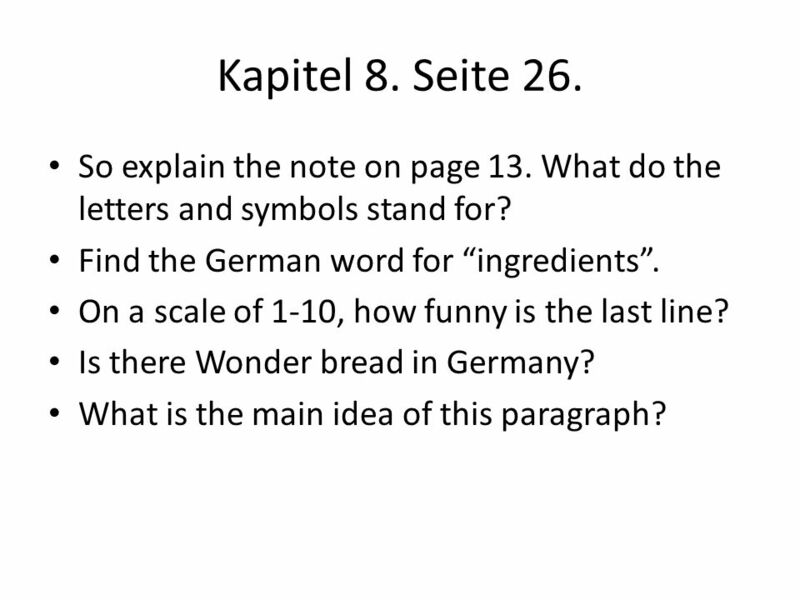 9 Kapitel 3. Seite Since they are dealing with an omen, Hilde and Günter play at something. What’s the gag? Let’s act out the scene. I’ll need 3 people to play Günter, Hilde and Max. The teacher will be the narrator and director. Pfeil = arrow. What’s the main point of this paragraph? 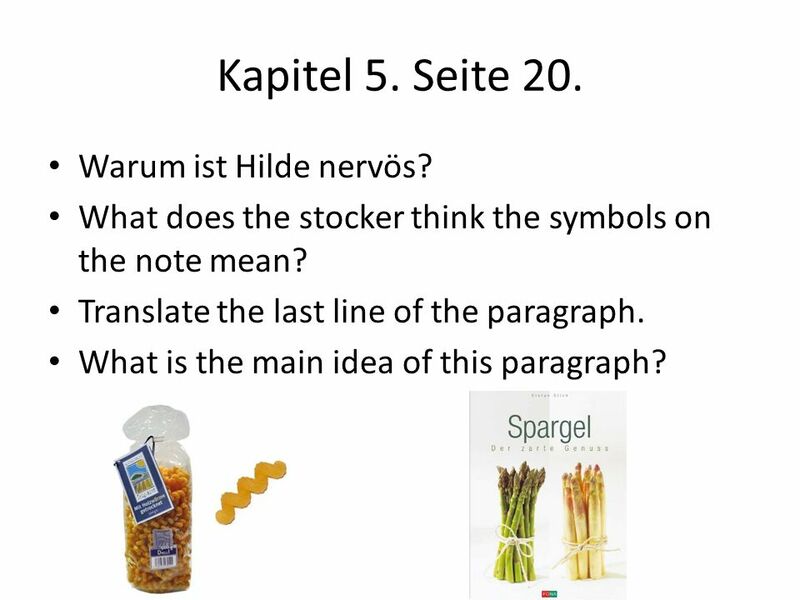 10 Kapitel 3. Seite 17-18. The arrow is pointing toward what? 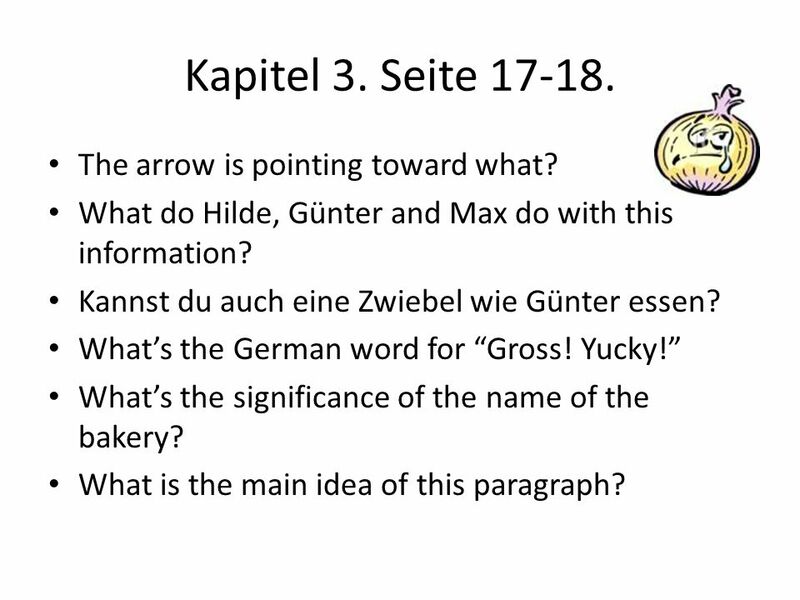 What do Hilde, Günter and Max do with this information? Kannst du auch eine Zwiebel wie Günter essen? What’s the German word for “Gross! Yucky!” What’s the significance of the name of the bakery? What is the main idea of this paragraph? 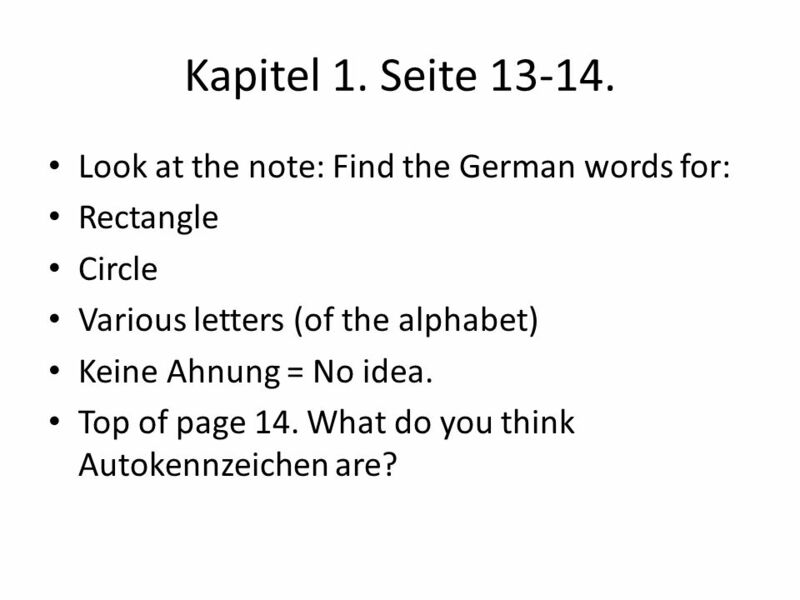 11 Kapitel 4. Seite 18-19. What is the Bavarian “hello”? 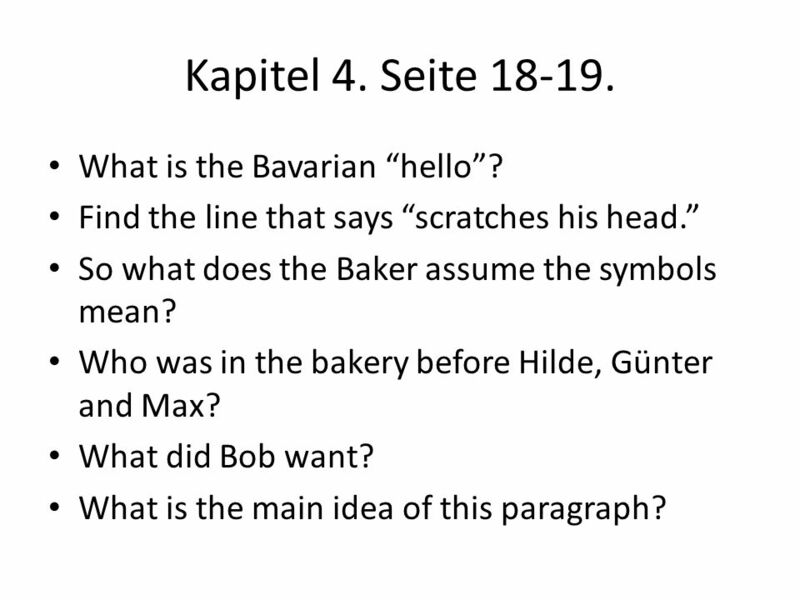 Find the line that says “scratches his head.” So what does the Baker assume the symbols mean? Who was in the bakery before Hilde, Günter and Max? What did Bob want? What is the main idea of this paragraph? So what is “miracle bread” (or what does the baker guess it is)? What did Bob buy from the baker? Why do Hilde and Günter copy Bob’s idea? 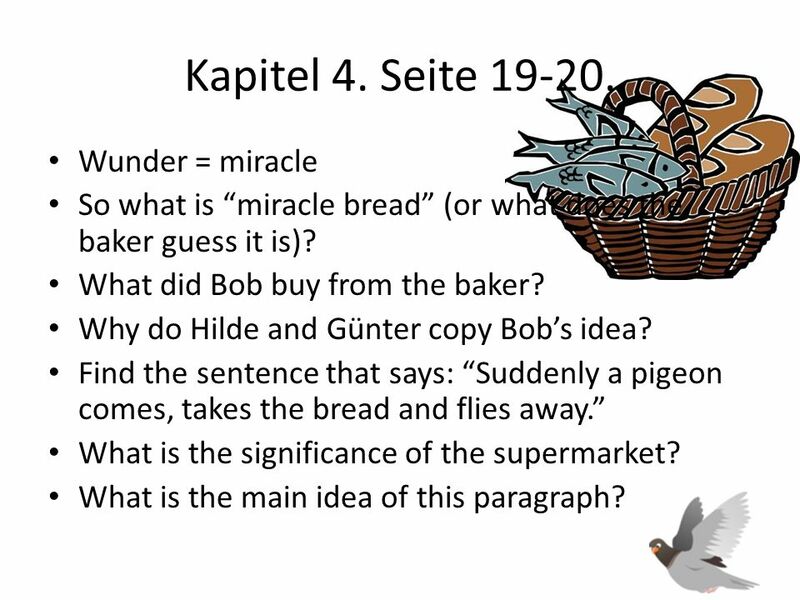 Find the sentence that says: “Suddenly a pigeon comes, takes the bread and flies away.” What is the significance of the supermarket? What is the main idea of this paragraph? 13 Kapitel 5. Seite 20. Warum ist Hilde nervös? What does the stocker think the symbols on the note mean? Translate the last line of the paragraph. What is the main idea of this paragraph? 14 Kapitel 5. 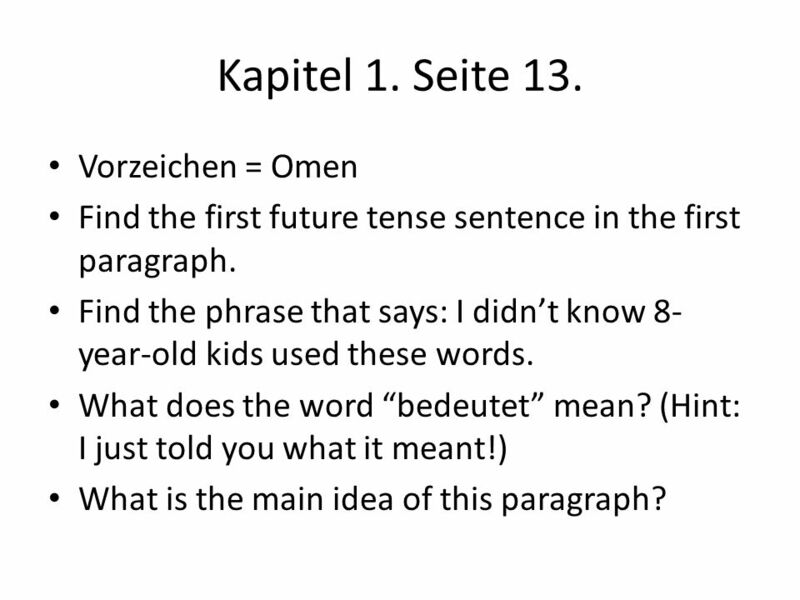 Seite This section will be acted out. The teacher is the narrator. 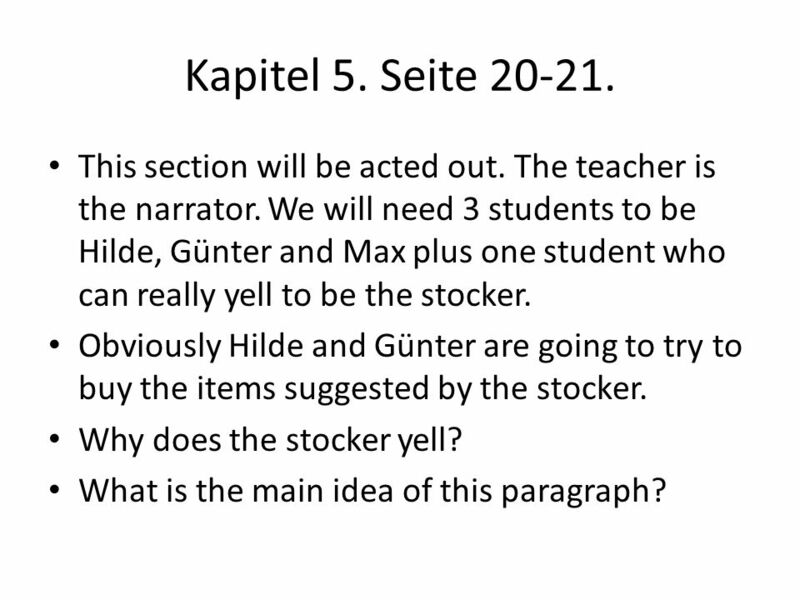 We will need 3 students to be Hilde, Günter and Max plus one student who can really yell to be the stocker. Obviously Hilde and Günter are going to try to buy the items suggested by the stocker. Why does the stocker yell? What is the main idea of this paragraph? 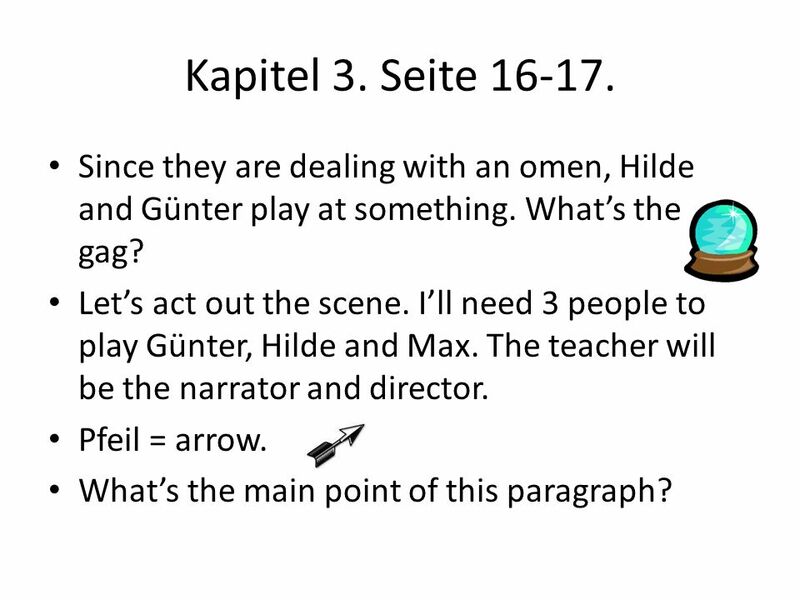 For this section, the teacher needs to really direct the students as to how Günter trips over Max, tries to grab on to the shelves to keep his balance, but ends up crashing along with all kinds of grocery items. 15 Kapitel 6. 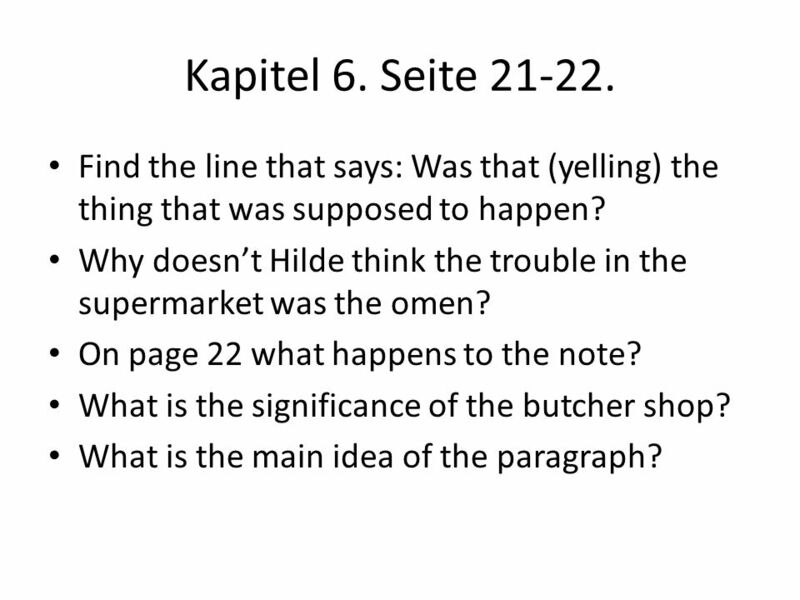 Seite Find the line that says: Was that (yelling) the thing that was supposed to happen? Why doesn’t Hilde think the trouble in the supermarket was the omen? On page 22 what happens to the note? 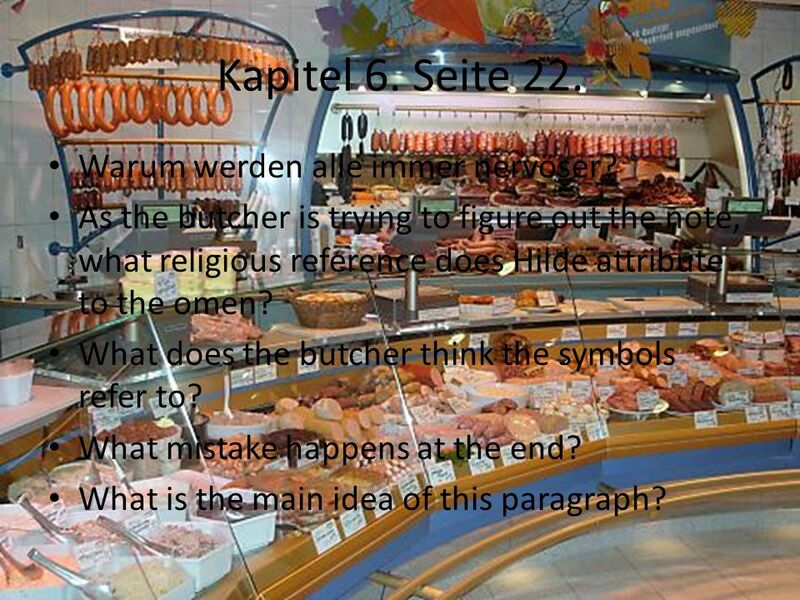 What is the significance of the butcher shop? 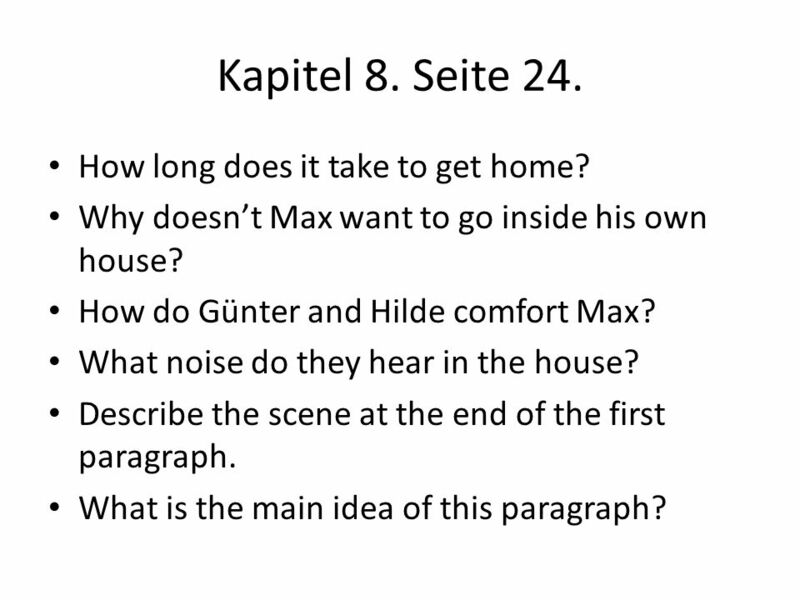 What is the main idea of the paragraph? 16 Kapitel 6. Seite 22. Warum werden alle immer nervöser? As the butcher is trying to figure out the note, what religious reference does Hilde attribute to the omen? What does the butcher think the symbols refer to? What mistake happens at the end? What is the main idea of this paragraph? 17 Kapitel 7. Seite 23. 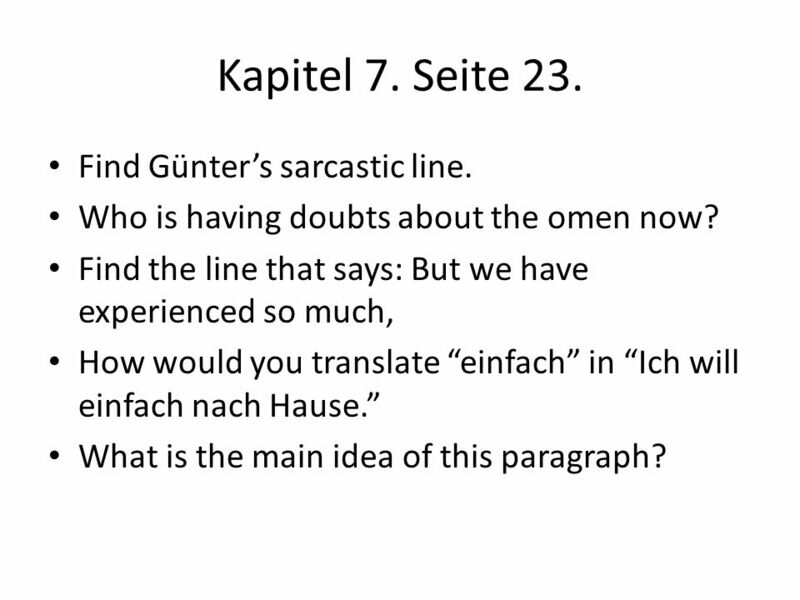 Find Günter’s sarcastic line. Who is having doubts about the omen now? Find the line that says: But we have experienced so much, How would you translate “einfach” in “Ich will einfach nach Hause.” What is the main idea of this paragraph? 18 Kapitel 7. Seite 23-24. Whom are they following? 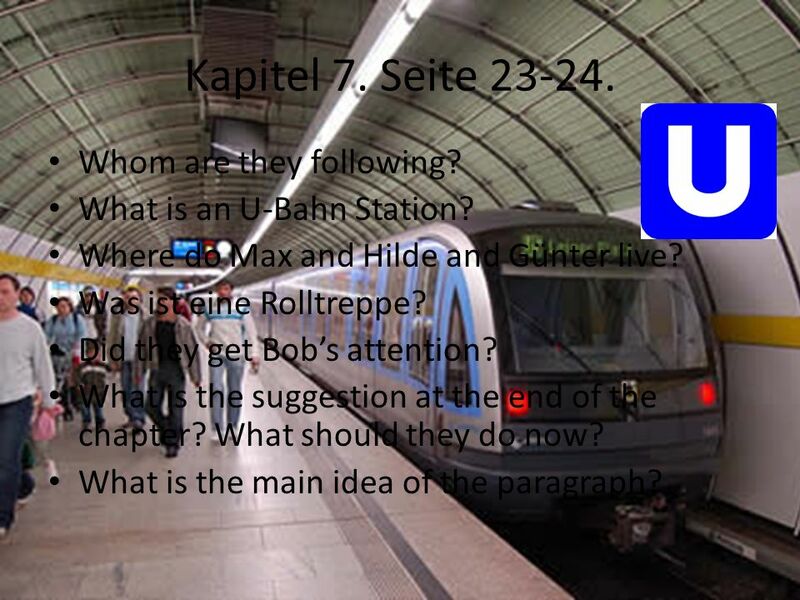 What is an U-Bahn Station? Where do Max and Hilde and Günter live? Was ist eine Rolltreppe? Did they get Bob’s attention? What is the suggestion at the end of the chapter? What should they do now? 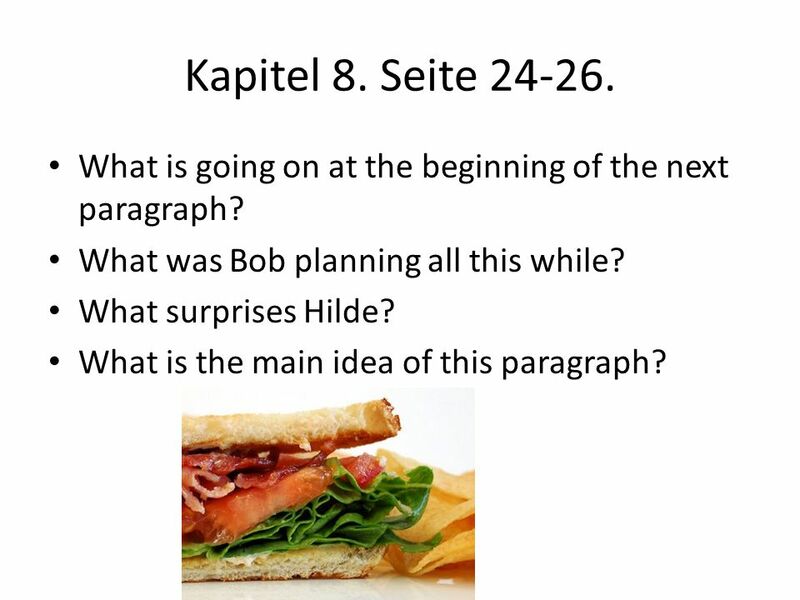 What is the main idea of the paragraph? 19 Kapitel 8. Seite 24. How long does it take to get home? Why doesn’t Max want to go inside his own house? How do Günter and Hilde comfort Max? What noise do they hear in the house? Describe the scene at the end of the first paragraph. What is the main idea of this paragraph? 20 Kapitel 8. Seite What is going on at the beginning of the next paragraph? What was Bob planning all this while? What surprises Hilde? What is the main idea of this paragraph? 21 Kapitel 8. Seite 26. So explain the note on page 13. What do the letters and symbols stand for? Find the German word for “ingredients”. On a scale of 1-10, how funny is the last line? 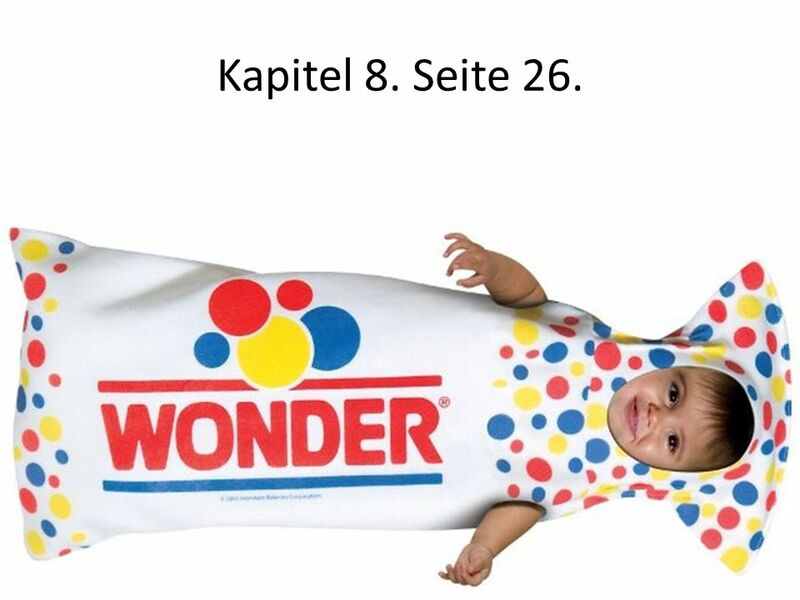 Is there Wonder bread in Germany? What is the main idea of this paragraph? 22 Kapitel 8. Seite 26. 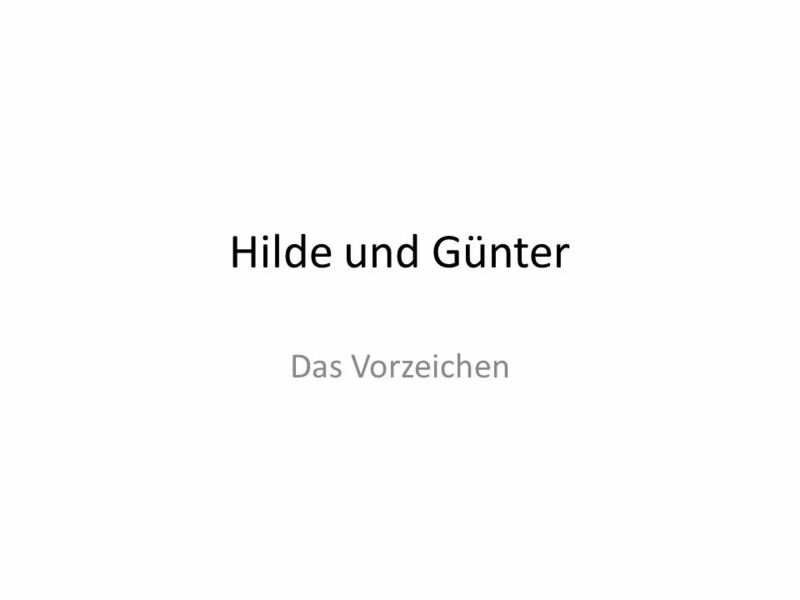 Download ppt "Hilde und Günter Das Vorzeichen." Vas a la agencia de viaje y quieres hacer un viaje a Pick a country Honduras, Colombia or Dominican Republic. Follow the prompts. Listen and answer accordingly. Identifying Our Own Style Extended DISC ® Personal Analysis.